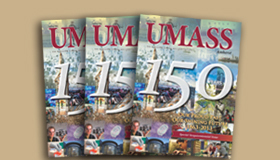 The University of Massachusetts Amherst was built on the premise that all deserving people of the Commonwealth should have the opportunity to receive a university degree, and that discoveries made and knowledge created should improve the quality of life for citizens of the Commonwealth and beyond. One hundred and fifty years ago, the university began with four faculty members, four wooden buildings, and 56 students. 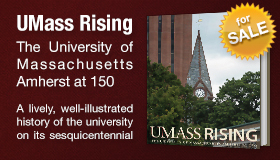 Today, UMass Amherst is one of the nation's top public research universities. The campus boasts world-renowned faculty and a student body with an unprecedented academic profile. World-class programs encompassing the 21st century knowledge base have led to competitive national and international rankings, academic citations, and hundreds of millions of dollars in research funding. 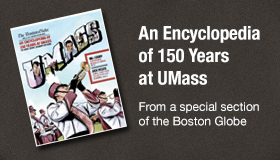 As the campus celebrates its sesquicentennial, we know, with certainty that the University of Massachusetts Amherst has come of age. The university, while proud of its “Mass Aggie” roots, has built an unstoppable momentum defined by innovation and a competitive dedication to excellence. One only has to survey the skyline of our magnificent campus to see, as construction cranes raise new structures skyward, that the bold experiment to democratize higher education and serve society that began 150 years ago is alive and well today – and has only now begun to hit its stride.